Aquamura wall panels provide a tough, durable finish ideal as an alternative to ceramic tiling in areas where hygiene is of paramount importance, wet areas and heavy traffic areas such as corridors, plus it complies with Class II surface spread of flame so ideal for commercial situations. The core material is 11mm thick Birch Plywood, faced with a decorative high pressure laminate balanced on the reverse with a special compensating laminate to help prevent bowing. Shower panels are 2400 x 1200mm x 11mm square cut, with one long edge finished to match the face colour and the other clean sawn. 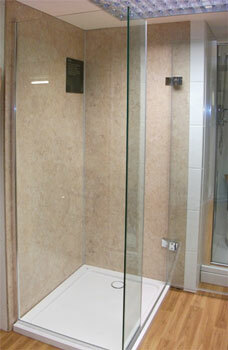 They are generally used in shower enclosures where the wall surfaces may be covered without joints. The panels can eaily be trimmed to size and glued to the wall resting on the shower tray and sealed with silicone sealer. Wall panels are 2400 x 590mm, with one long edge tongued and the other grooved. These are convenient for cladding larger areas where they can be easily and quickly installed with no visible surface fixings. Especially in commercial settings Aquamura panels provide a cost-effective yet elegant way to transform walls. Aquamura always looks good and often all that is needed to keep it clean is a quick wipe over with a damp cloth but never use abrasives or cream cleaners as these will scratch the surface. The cost of the panels is a little more than most tiles but the labour time is considerably less and once installed there is no grout to discolour or go mouldy. 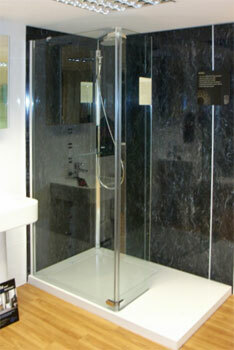 Therefore considering the lower fitting costs and long term benefits Aquamura has to offer it is not expensive. Anyone with basic DIY skills can install it as it is easy to cut amd fit using the specially designed corner trims, adhesive and sealant.